Box Dimensions (LxWxH) 7.6 x 4.4 x 1.25"
UltraChrome Cyan Ink Cartridge (110ml) is rated 5.0 out of 5 by 6. Rated 5 out of 5 by Mike from Nashville from Pricey but consistent quality I once purchased a knock off brand since my old Epson 9800 is over 7 years old. Immediately got clogged jets. I was able to use the old treatment of saturated paper towels with glass cleaner over a few days, over and over and I got it to work again. Not worth it for me to buy generic though it would save quite a bit per sets of cartridges. However, B&H has great pricing so there you go. Rated 5 out of 5 by sk8er48 from Great price on ink! I am a proffesional wedding photographer. My partner and I needed ink for our Epson 7800 printer. She suggested that I buy from Epson since they had a 15% discount. I checked there site and compared them with B&H. B&H was another 10% less than Epson's site! 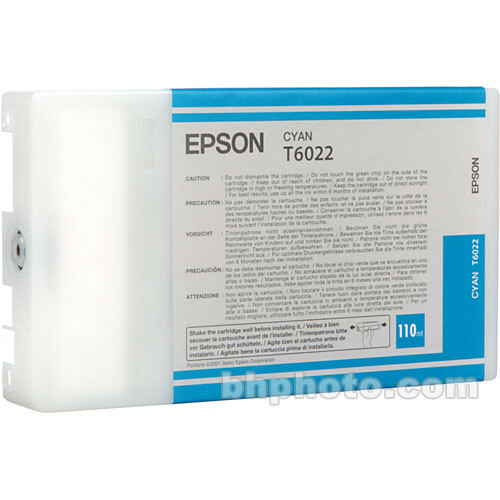 Rated 5 out of 5 by Charles from Good deal This long life ink from Epson meets a professionals need and demands. Rated 5 out of 5 by Steven from Great Ink Epson Ink has beautiful colors. Easy to install.